The CC 8800-1 Twin crane was found to be the best for the job. The Terex CC 8800-1 Twin crane lifting an AGR absorber in Qatar. The Terex CC 8800-1 on site in Yanbu. 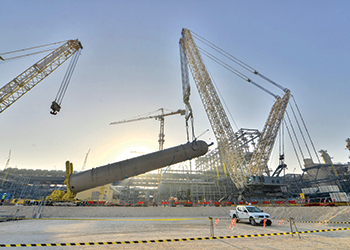 Terex Corporation’s CC 8800-1 cranes in various capacities have been rising to the heavy-lift challenges in a wide range of projects in the region, the most recent being the construction of oil and gas facilities in Qatar and Saudi Arabia. 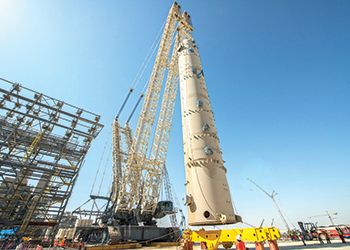 In Qatar, Al Jaber Heavy Lift and Transport recently used its 3,200-tonne-capacity Terex CC 8800-1 Twin crane to help complete a series of super-heavy lifts on a massive liquefied natural gas (LNG) processing train. The project involved a total of 143 lifts, 31 of which were carried out using the 1,600-tonne capacity Terex CC 8800-1 crane and two lifts – installing two advanced gas reactor (AGR) absorbers, each weighing 1,300 tonnes – with the crane in its twin format. The lifts were planned by Al Jaber site manager Sevi Phillip over a period of 18 months with the two AGR absorber lifts critical in the company being awarded the contract, says a spokesman for Terex. “The single-boom 1,600-tonne-capacity CC 8800-1 crane was already on site to carry out the smaller capacity lifts; the crane was then adapted to SSL Twin configuration by adding the second boom to lift the two AGR absorbers,” he explains. Once fully rigged in twin format, the self-propelled modular trailers (SPMTs) used to move the huge columns into position were also assembled. Each absorber was raised from the horizontal to the vertical using the CC 8800-1 Twin crane as the main lift crane and using a tail frame to control the base of the absorber. The Terex CC 8800-1 Twin crane lifting an AGR absorber in Qatar. Once the CC 8800-1 Twin crane lifted the absorber clear of the SPMTs, the trailer was moved out of the way and the lift continued until the column was vertical. At this point, the tail frame was then removed, leaving the crane to carry the whole weight of the absorber. Next, the crane slewed through 90 degrees and placed the column into its final position on the specially prepared foundation. The Twin was then partially de-rigged so that it could track a short distance into the correct position to carry out the second lift and then be re-assembled to carry out the identical lift sequence with the second AGR absorber. Mark Rowlands, project manager with Al Jaber, says the contract was further complicated because of the intense heat in the summer and wind variations. “The Terex CC 8800-1 Twin is not just the best crane for the job, but the best crane. It was comfortable, easy to use, stable and flexible and the operators were very happy with its precise and user-friendly controls,” he comments. The AGR absorber column is a critical item in the LNG processing train, helping remove hydrogen sulphide, carbon dioxide and organic sulphurs in the raw feed gas so it complies with LNG liquefaction process or sales gas production standards. Alex Mullins, executive director, Al Jaber and responsible for all international activities says the project was an example of the excellent working relationship with Terex. Al Jaber’s fleet of heavy cranes and specialist transport equipment puts it in the top 10 heavy lift companies in the world. Meanwhile, in Saudi Arabia, when Gulf Haulage Heavy Lift (GHHL) was tasked by Saudi Aramco to provide a solution to installing a 200-m-high flare stack – with stack structure segments weighing from 21 to 104 tonnes – at its Yanbu facility, it immediately knew that only one crane in its fleet was the right choice to efficiently complete the job on time and within budget – the Terex CC 8800-1. Saudi’s environmental improvement programme recently increased the height standards for flare stacks used to burn off flammable gas generated by the oil refining process. Saudi Aramco was the first oil company to install a flare stack at its Yanbu facility under these new environmental guidelines. The sheer size and weight of structure segments made the construction project difficult enough. However, the Yanbu Aramco Sinopec Refinery’s location, nearby the Red Sea, severely limited the time crews had to complete each lift. “Every day at approximately 11:00 hours, winds would increase from a light breeze of 2 m per second to sustained gusts reaching 16 m per second, and this would sometimes continue all afternoon and evening,” says Sanjay Pachisia, general manager of the Dammam-based GHHL. This was well outside the project’s permissible lift wind speed levels, which ranged from 4.1 m per second to 7.1 m per second, depending on which flare section was being positioned. The project also required a low ground bearing pressure of 12 tonnes per sq m for constructing the crane’s boom configurations and lifting the flare stack. “The CC 8800-1 crawler crane has 2-m-wide tracks and offers a wide 10.5-m stance to help disburse the weight over a wide area for heavy lift projects,” says Christian Kassner, senior sales manager for Terex Cranes. A wide crawler stance plus the use of heavy-duty, 5-m-long by 2.8-m-wide by 0.36-m-thick steel matting helped GHHL’s operators meet the project’s ground pressure requirements for the crane. Additionally, precise rigging and flare section placement was a must on this project. “The centre of gravity for each section was not in the centre of the flare structures due to the risers, nor was the section installed in the centre of the structure,” says Pachisia. With the site challenges and flare section size and weight known, GHHL prepared and mobilised the CC 8800-1 crane components for the nearly 1,400-km trip from its Dammam headquarters to the Yanbu project site. The Terex CC 8800-1 on site in Yanbu. “To move the crane, we used seven heavy-duty trailers, 12 low-bed trailers and 40 flat-bed trailers with 12-m deck lengths,” says Pachisia. Designed and built as a series, the 1,600-tonne capacity Terex CC 8800-1 crane has a standardised production process, so that transportation, rigging and maintenance ease are built into each crane. Once on site, GHHL’s five-person rigging crew began crane assembly. For the first lift, which placed the third-level flare segment 100.3-m above ground level, the CC 8800-1 was equipped with 108 m of main boom and its superlift system to hoist the 104-tonne section into place. For the second and third lifts, which placed the level four segment and level five structure into position, crews simply reconfigured the crane by adding its luffing jib on the main boom. Hydraulic pin connections between boom segments greatly simplified adding boom segments. The final three lifts for flare structure levels six through eight required one final configuration change. In addition to the main boom, crews used the luffing jib – configured to the maximum boom length of 216 m – and available runner winch, so they would have the necessary height and control to place these segments. In all, the Yanbu Aramco Sinopec Refinery project required just 11 working days to complete the six complex lifts to finish placing the flare stack segments. 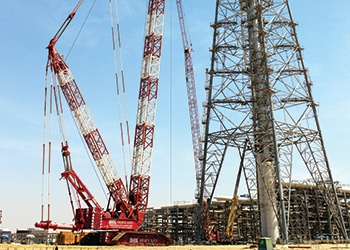 Once completed, crews disassembled the CC 8800-1 crane and mobilised it back to GHHL’s Dammam facility, a process that took approximately 10 days. For over 34 years, GHHL has been the market leader in offering specialised heavy haulage and erection, engineering and planning, customs clearing and world-wide project cargo handling services to companies operating in Saudi Arabia and the Middle East. GHHL specialises in the engineering, planning and execution of transporting extremely heavy and oversize cargo and delicate equipment. Its heavy erection services utilise the most modern heavy lift crawler cranes available on the market, ranging from the Terex CC 1800 to the massive 1,764-tonne capacity class Terex CC 8800-1 crane. Terex Corporation is a lifting and material handling solutions company reporting in five business segments: aerial work platforms, construction, cranes, material handling and port solutions and materials processing. It manufactures a broad range of equipment serving customers in various industries, including the construction, infrastructure, manufacturing, shipping, transportation, refining, energy, utility, quarrying and mining industries. Terex also offers financial products and services to assist in the acquisition of company equipment through Terex Financial Services.